At Baltimore/Washington International Thurgood Marshall (BWI) Airport (Concourse A), Maryland gourmet chocolatier SPAGnVOLA now offers an array of handcrafted chocolate bars, bonbons and truffles made with cacao beans from a single-estate farm in the Dominican Republic that are roasted in Gaithersburg, Md. 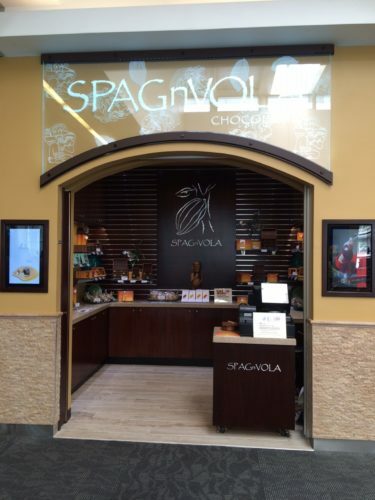 SPAGnVOLA was named one of the top 10 chocolate shops in the world by National Geographic. Cities have them, so why not airports? Baltimore/Washington International Thurgood Marshall Airport (BWI) has teamed up with bike-sharing company Zagster, and placed a rack of 10 rentable bikes outside the airport’s International Terminal. Renting a bike via the Zagster app is $5 for up to 12 hours of use. Why rent a bike at BWI? So you don’t have to just hang out during a long wait for your flight and because BWI has a 12.5 mile scenic outdoor trail encircles the airport property that has a children’s playground and an observation area. 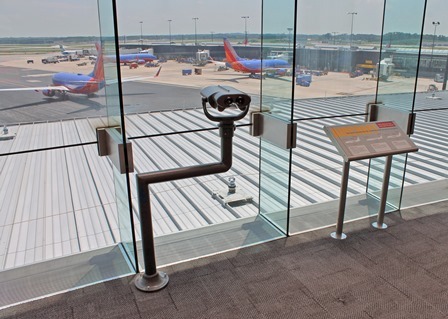 The Observation Deck – one of the best amenities at Baltimore/Washington International Thurgood Marshall Airport has re-opened to the public. And it’s fresh and spiffy and updated. First opened in 1995 and closed since 2012 to make way for some terminal enhancements, the renewed Observation Deck has new exhibits and a new food outlet called Sky Azure. 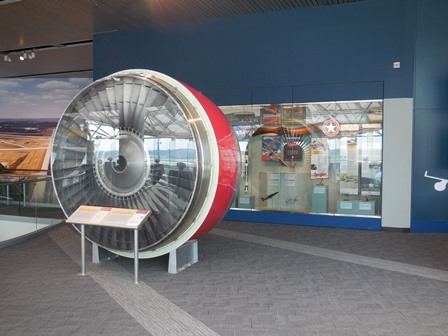 New exhibits include a 28-foottall sounding rocket from the National Aeronautics and Space Administration (NASA), a half-sized model of the Johns Hopkins University Applied Physics Laboratory’s Solar Probe Plus spacecraft and some new interpretive information about the large sections of a Boeing 737-200 aircraft that were originally on site. There’s also a new photo mural near the aircraft cockpit that displays a pilot’s view when landing on Runway 33L at BWI Marshall, charging stations, a display case filled with aircraft models, new children’s play equipment and new binocular viewers so you can get a better view of airport operations. Sound like someplace you’d like to hang out? The BWI Marshall Observation Gallery is located pre-security, on the upper level of BWI between Concourse B and Concourse C.
I’m a big fan of free Wi-Fi service at airports, so was delighted to learn that Baltimore/Washington International Thurgood Marshall Airport is the latest major airport to add that amenity to its offerings. BWI is adopting the model many other airports are using: a free wireless Internet session for travelers willing to watch a short ad or paid “premium” service. Many airports are limiting their free wireless access to one session for 15-30 minutes, but I’m glad to see that BWI is offering a complimentary 45 minute wireless session with the option to get another in exchange for watching another ad. “Speak Truth To Power,” a photography exhibition from the Robert F. Kennedy Center for Justice and Human Rights, is on display through May 31, 2012 in the International Terminal at Baltimore/Washington International Thurgood Marshall Airport. Elie Wiesel: novelist, journalist, Nobel Prize winner and political activist. “Speak Truth To Power” is a collection of moving and powerful photographs by the late Pulitzer Prize-winning photojournalist Eddie Adams that document courage by featuring human rights defenders around the globe.